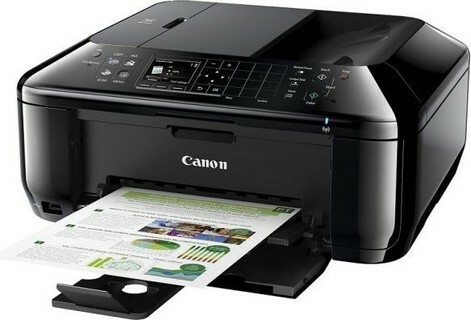 This compact All-In-One, with sleek all-black design and built in Wi-Fi connectivity, is perfectly placed to help you print, copy, scan and fax – from wherever suits you best. Canon’s FINE ink technology, with minimum 2pl ink droplets and print resolution up to 4800 x 1200 dpi, delivers glorious colours and crisp text – ideal for business documents or photos. Scanning, copying or faxing large documents is quick and easy for more productive working, thanks to a fully-integrated 30-sheet Automatic Document Feeder. The scan and save to a compact pdf feature is ideal for archiving. Additionally, you can scan-to-email for efficient workflow. For further savings you can print more for less, with the high yield Canon XL cartridges, which offer 50% lower cost per page. The compact FastFront design means paper and ink cartridges can be loaded from the front of the printer – making it easier to fit into a busy work space. Quick Start functionality means there is no need to wait for the printer to ‘warm up’. Operation is almost instantaneous from the moment the power is switched on, ensuring that the user can perform actions virtually straight away. Super G3 faxing is fast and reliable. Incoming faxes can be saved as a PDF file to USB memory for viewing and keeping a digital record. You can also reduce costs as you can choose what to print. Take control of your web printing, easily combining content from several websites with Easy-WebPrint EX. Automatically optimising the quality and legibility of scanned documents is simple with Auto Document Fix. For additional security, MP Navigator EX adds passwords to PDFs restricting who can edit or print sensitive documents. Support for Apple AirPrint enables you to print directly to the PIXMA MX434/MX434 from a compatible mobile device.